At your fingertips: Surf news on the go with the Kindle. The 6-inch Global Kindle, the recently launched international version of Amazon’s “electronic book reader", is a device that supremely replicates the essential reading experience of a book. It is easy to use, easy on the eyes, entirely non-intrusive when you read, and light enough (290g) to ignore in your knapsack. In short, it is worth almost every kilobyte of hype surrounding it. There are shortcomings, of course, and most of our cribs have to do with available content, pricing and some technology. As an achievement of transformational engineering, the Kindle is disruptive and path-breaking. It is the beginning of something great—or terrible, depending on which side of the book-device fence you are. Now, how does the device work? The heart, soul and creative mojo of the device lies in an innovation known as E Ink. 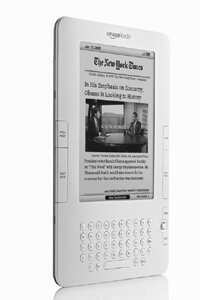 Every image you see on the Kindle’s 6-inch monochrome display is composed of millions of charged white and black particles. Depending on the electrical charge applied to a region, it turns white, black or a shade in between (the Global version of the device we reviewed has 16 shades of grey, which makes pictures, book covers and illustrations look passable). So every time you flip a page, a series of electric signals rearrange all these particles, forming a new page. The power then shuts down. This means the Kindle only uses power to change pages, and not to display them (which is unlike any other device you use today, from phones to gaming consoles). This is why on a full charge the Kindle will last for anywhere between one and two weeks, depending on your use of the wireless. When you buy a Kindle Global from Amazon, the device is preconfigured to work off mobile networks in around 100 countries. You don’t have to worry about connections or subscriptions. It just works out of the box. This is the connection you will use to buy books, magazines and newspapers from the Kindle store. Yes, this content is expensive—a subscription to The New York Times will put you back by around Rs1,000 a month—but the assurance of delivery is unmatched. One of the most amazing experiences of using the Kindle is when you buy something from the store. Less than a minute after confirming a subscription for a newspaper, an email in your inbox informs you of the purchase. Another minute, and the latest issue is ready on your Kindle for reading. Download sizes are minuscule. Which is also why the Kindle Global can hold up to 1,500 books at one time. Most people’s entire library would fit into the device effortlessly. But if you’d rather not spend dollars, convertors that can change most documents into Kindle-friendly formats are freely available online and a recent upgrade made the device support PDF files natively. Besides expensive content, we also disliked the lack of a backlight. There is no way to read the Kindle in the dark. You need a light source. The Kindle is currently available for sale from Amazon.com for $259 (approx. Rs12,100), plus around $120 in shipping charges and import duty deposits. Some of this import duty might be refundable. Reliable sources tell us that the device will set you back, in total, by around Rs18,000. Enough to buy 30 good books, you say hoarsely? Please do not disturb while we are trying to read.